The Cuckoo's Calling has been kicked out of the nest a little earlier than anticipated, thanks to a mysterious London-based Tweeter. If you've heard of The Cuckoo's Calling, a crime novel by Robert Galbraith, you're either a fan of obscure first time writers, or you happen to know - as a London-based Twitter user apparently did - that Galbraith is actually J.K. Rowling, of Harry Potter fame. Rowling had been using Galbraith as an alias, and had hoped that the deception might carry on for a while longer, but it was not to be. Sunday Times columnist India Knight got the tip from someone known only as Jude Callegari - whose Rowling Tweets have since been deleted - and once Knight got hold of the story, Rowling's anonymity was a thing of the past. "I had hoped to keep this secret a little longer, because being Robert Galbraith has been such a liberating experience," said Rowling. "It has been wonderful to publish without hype or expectation, and pure pleasure to get feedback under a different name." Not that many people were reading The Cuckoo's Calling before this revelation; it sold 1,500 copies, hardcover and ebook, but that was it. No doubt that will change, and Galbraith's second novel - due next year - will get a much wider audience. Nobody seems to know who Jude Callegari is or how Callegari knew Rowling's secret. The account is two years old and hasn't often been used, except for the usual trivia and pictures. Callegari obviously lives in London, and Rowling's publishers are based at Victoria Embankment, but that's a slender thread at best to connect the two. Is it any good, you ask? Well, not having read it, I can't judge. But if you were wondering what the Harry Potter writer was up to in her spare time, there's an eBook out there which you may be interested in. Update: It would seem Chris Gossage, a partner at Rowling's lawyers, Russells Solicitors, was the inadvertent leaker. He told his wife's best friend, Judith Callegari, who promptly Tweeted it to Knight. Russells has since apologized unreservedly. "Whilst accepting [Gossage's] own culpability," said Russells in a statement, "the disclosure was made in confidence to someone he trusted implicitly. On becoming aware of the circumstances, we immediately notified J.K. Rowling's agent. 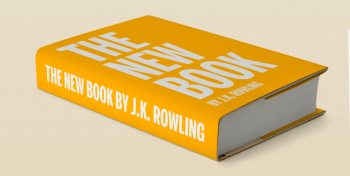 We can confirm that this leak was not part of any marketing plan and that neither J.K. Rowling, her agent nor publishers were in any way involved."